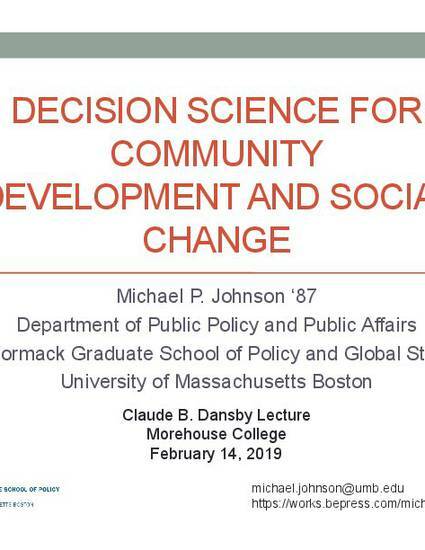 "Decision Science for Community Development and Social Change" by Michael P Johnson, Jr.
Operations research, also known as management science or decision science, is a mathematics-based discipline that draws from engineering, information systems, management, public policy and planning. OR enables individuals and organizations to make better decisions regarding manufacturing and logistics, service provision and strategy design. My particular interest in OR focuses on the needs of mission-driven and resource-constrained organizations that serve urban communities. In my talk I will describe how OR can use qualitative and quantitative analysis through meaningful engagement of communities to enable creative identification, formulation and solution of complex problems for local impact and social justice. Specific applications I'm currently studying include: community-based housing foreclosure response; redevelopment of distressed neighborhoods; redesign of school districts facing enrollment decline, and local economic development. I'll conclude by drawing connections between community-engaged OR and current trends in data and technology innovations known as 'Big Data' and 'Smart Cities'.